Rather than sleeping in and staying out of the cold weather on a holiday, nearly 300 Indiana State University students volunteered Monday at 30 sites throughout the Wabash Valley for Martin Luther King Jr. Day of Service. "It's great that we have this many people coming in on a terribly cold day that is also a holiday," President Dan Bradley said. Bradley himself participated in volunteering at St. Benedict's Soup Kitchen helping move boxes of canned foods with ISU students. The Martin Luther King Jr. Day of Service is a day set aside for students to celebrate King's legacy, a chance to give back to Terre Haute, and the opportunity to make a difference that is put together by the Center for Community Engagement. By traveling to various sites, students were able to share what encouraged them to come out and volunteer. 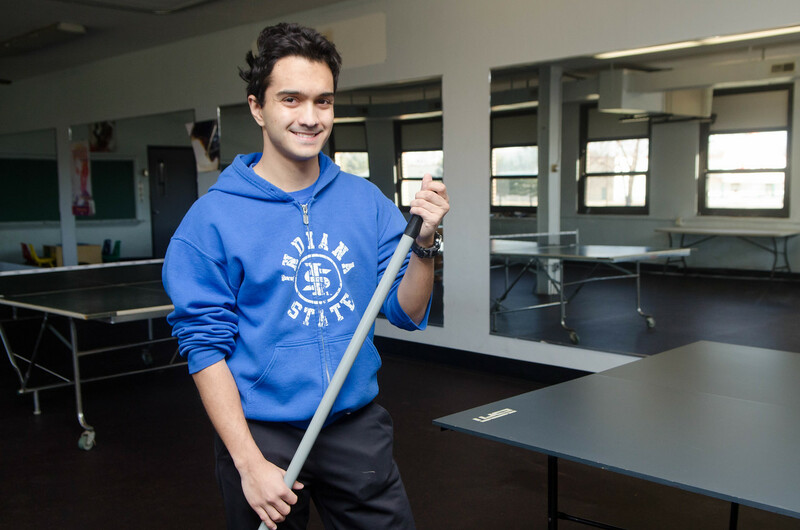 Students such as these helped Indiana State achieve the rank of being No. 1 in service as ranked by the Washington Monthly. Aaron Schaidle, a junior nursing major, volunteered at the Boys and Girls Club of Terre Haute. Here he organized supply closets, cleaned the game room, and played with kids. "I think it is a great way to help out the ISU community and I am also a President Scholar so I am fulfilling my contribution on giving back to the community as part of my scholarship commitment," said Schaidle. This was Schaidle's first time serving at the Boys and Girls Club. He saw it a new opportunity to get connected with the children of Terre Haute and give back to this part of the community. 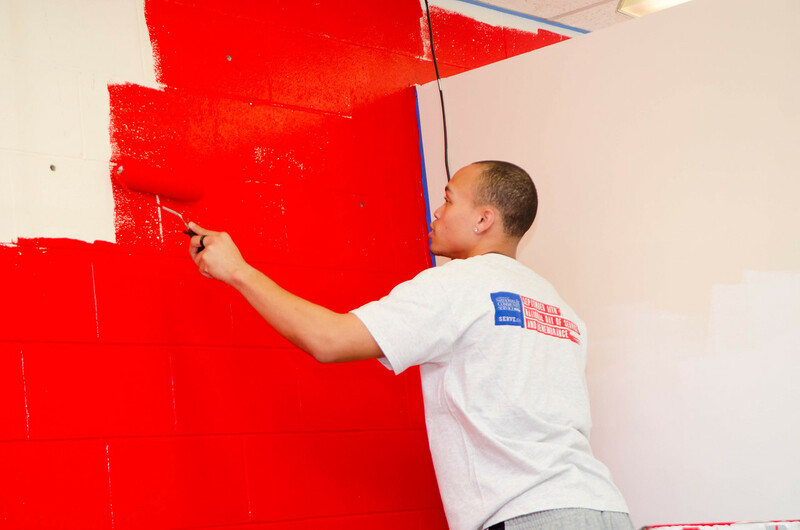 Other students spent their time during helping the American Red Cross paint. "I volunteered to make an impact not only for myself, but to inspire others that they can also make a difference," said Tasia Robinson, a graduate student in human resource development and a volunteer painter. "It's up to us as a younger generation to step up and volunteer." Gunner Davis, a freshman business administration major and Networks Scholar, joined other students and President Bradley moving canned foods, taking out garbage, cleaning cabinets, and more at St. Benedict's Soup Kitchen. "Terre Haute offers students a lot more than what they probably think and I think it is important for students to give back to the town that supports them," Davis said. The Center for Community Engagement not only arranged the Martin Luther King Jr. Day of Service, but also puts together other service opportunities for students such as Donaghy Days and Stop and Serves. "It is really awesome how ISU sets up the connections for students to volunteer places, so all we have to do is sign in or swipe card and it's easy as that to go volunteer," said Allison Crick, a freshman marketing and management major. Crick volunteered at Goodwill because she has previously donated there before but wanted to see what all Goodwill does in the background. Jessica Starr, Center for Community Engagement program coordinator, is working on other one day student service events in Terre Haute. Students can also participate in Stop and Serve that takes place every Wednesday in the Hulman Memorial Student Union from 11:30 a.m. to 1:30 p.m.
"It's been a great experience and I'm really thankful for ISU being able to allow us to spend so much time volunteering and setting up ways to make it easier for us to do," Crick said. Media contact: Jessica Starr, program coordinator, Center for Community Engagement, Indiana State University, Jessica.Starr@indstate.edu or 812-237-4491.